Things reached a breaking point last November. I was leading a classroom discussion on the theological dimensions of Martin Luther King Jr.’s works. I wanted my students to see how Scripture animated King’s words and deeds, and how his “Letter from Birmingham Jail” can be read as a summons to be an “extremist in love,” one who finds in Jesus Christ the spark enkindling our work for justice. Much of the class listened with rapt attention. Many nodded, one noted that today’s social media works to fan outrage and anger but does not often offer constructive solutions, and for a moment I felt that they saw why a course in theology is essential to their education. My excitement was shattered when I turned and saw one student on his laptop looking at shoes for sale online, and another, head turned down, texting frantically on his cellphone. I turned and saw one student on his laptop looking at shoes for sale online, and another, head turned down, texting frantically on his cellphone. I could have kept my focus on those showing enthusiasm, but I surrendered control to two students who quite probably had no sense of the impact they were having. Without singling them out directly, I stopped and made a snarky comment on how some people risk their lives for civil rights and others think shopping and texting are more important. They both registered that I was addressing them and turned away from their devices. It was a pyrrhic victory, though, because I could sense that I had lost them for the rest of the term. This semester, I will be teaching a course with a “theology lab” component: Each meeting involves 15 minutes of contemplative silence. Rather than simply reading about contemplation, we will trek into what Martin Laird, O.S.A., calls “The Silent Land.” We can avail ourselves of no GPS as we explore this desert for, as St. John of the Cross wrote, the land of the Spirit is a “land without a way.” My goal is to foster a seeking community that will discover within the spiritual desert the theological oasis from which the waters of justice flow. Instead of informing the students about theology, I want to invite them to be formed through the theological quest. I want my students to surrender their electronic security blankets. Because of the nature of the course, I am banning the use of all electronic devices. If I see them, their owners are marked absent from class. For the goal of this course is not for students to accumulate information but for them to undertake an experiment in theological formation. To serve this end, theology lab is doubling as “rehab” to help students kick, or at least acknowledge, their tech habits at least twice a week. Within a classroom environment, let alone any social context, texting or surfing the web can be interpreted as an act of disrespect. It communicates to your instructor and to your classmates that whatever is on your screen is more important than they are. It may seem innocent but, to those around you, it communicates: What you are sharing is not worthy of my time or attention. In addition to being rude, I suspect an unreflective use of technology contributes to anxiety and social isolation. Since this course invites us into a place of deep spiritual exploration and seeks to work against anxiety and isolation, you are being invited into a forced hiatus from your devices for 1:15 minutes twice a week. This ban on devices may seem harsh, but I think it essential to prevent the course’s content and context from being separated. I want my students to surrender their electronic security blankets. (Of course, if a student is tending to an ailing parent or has child care concerns, accommodations can be made.) The class invites students to become pilgrims rather than mere theological tourists. Theology lab can help them to see how contemplation can help to integrate what we learn with who we are. For a generation raised with phones, even temporarily giving up their devices is bound to provoke some initial anxiety and fear. My wager: If they invest themselves in this practice, they should find themselves ever more present to one another and to themselves. Anxieties will subside and feelings of isolation will dissipate as they discover how even when they are alone they are never truly alone. They are not “sole seekers” but, in this endeavor, “soul seekers” exploring the hitherto uncharted territory of the human spirit. In place of the latest apps, we have only to close our eyes and journey together into the silent land. I have no illusion that my theology lab exercise will become a campus craze, but it might plant the seeds for a new mode of contemplative awareness in one group of students. And if these young pilgrims discover themselves to be drinking from the same wellspring as the prophets, Jesus and the saints, then the theology course may cease to be an elective and become an opportunity for students to know themselves as God’s beloved. Lecturers and teachers need to prepare their stuff well. Cell phones are good companions outside lecture hours. I fully support this initiative, because it is very right. In such cases, they just need assistance in education and in order to interest them in their studies. In this case, they can help assignment help learn more at Edubirdie. I think that this is very wrong when they sit in the phones and do not intend to learn anything. Great article! I think it's a great idea to keep cell phones, even all gadgets out of the classroom if they're not essential for particular class. It can distract you from your studying process. I've had some problems with it myself. Thanks to these guys https://writingpeak.co.uk/write-my-research-paper-cheap , I didn't get thrown out of the school. 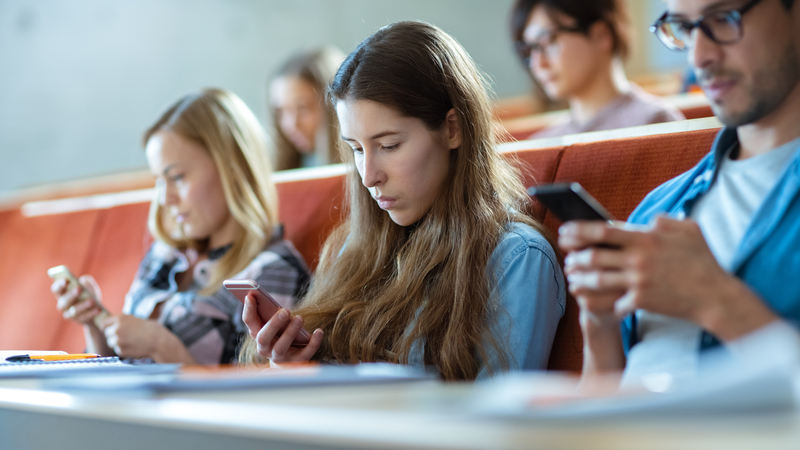 This article also appeared in print, under the headline "For true awareness, keep cellphones out of the classroom ," in the February 4, 2019 issue.